Discover convenience like never before by incorporating Wine By Your Side 3-Piece Wine Holder Set into dining experiences in a variety of settings. The unique design clears space on the table for food and avoids overcrowding. 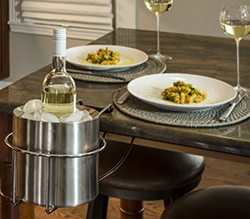 Discover convenience like never before by incorporating Wine By Your Side 3-Piece Wine Holder Set into your dining experiences in a variety of settings. Keep conversation flowing and continue to enjoy a delicious meal without having to stop and flag down a waiter at restaurant to request another drink. The innovate design clears space on the table for food and avoids overcrowding. The solution to having a relaxed and uninterrupted dinner is easy and the result is outstanding. Make the next meal a memorable one by adding Wine By Your Side to immediately enhance overall dining experience.